Ann Arbor, May 22, 2018 – A study published in the American Journal of Preventive Medicine sheds new light on the sharp rise in fatal drug overdoses in recent years, one of the most severe public health challenges of our time. 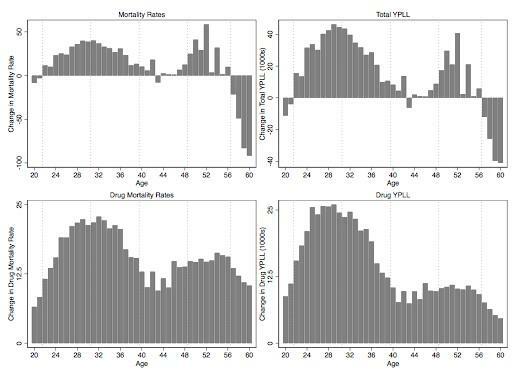 The study found that the growth in fatal overdoses for non-Hispanic whites (NHWs) aged 22-56 years was sufficiently large to account for the entire growth in mortality rates (MR) and years of potential life lost (YPLL) for this population from 1999 to 2015. "Particularly noteworthy is the rapid rise in lost life years and mortality rates for non-Hispanic white males in their 20s and 30s. These increases are considerably larger than those experienced by corresponding men or women in their 40s and 50s, who have been the focus of earlier analyses," explained Christopher J. Ruhm, PhD, Frank Batten School of Leadership and Public Policy, University of Virginia, Charlottesville, VA, USA. He points out that focusing on whites in their 40s and 50s missed important components of MR and YPLL growth.